Those clouds are steam clouds! should've known doh! I'm so silly hehe. Still like the shot as much as I did when I first saw it and perhaps a bit more. The clouds are so very intense, well captured. beautiful capture. Comp seems a bit tight on top. Amazing just the same. Nice capture - I think a tighter crop to get rid of that distracting electricity pole in the foreground would have helped add more impact to this great shot. Wow beautiful shot, love the sky and composition of your shot. Nice work. Great clouds and exposure. Just wish the whole tip of the antenna was there. You could have edited out the top to give it some space. this is absolutely beautiful - HDR? The clouds behind the lighthouse are amazing, love the splash of red at the top of the tower, brill!! Wow those clouds are amazing. I like the pop of red. It works for me. Wow, great photo, I hope with the centered composition it does well. I like it. Wow! 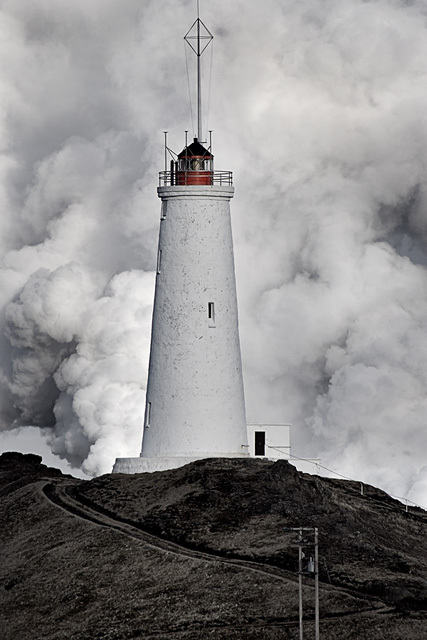 That is clouds behind the lighthouse? If I didn't see the title I would have thought a volcano erupted or something! Those are some seriously intense clouds! Now this I like. Very nice. The cloud/fog background is striking! Interesting - and arresting - juxtaposition, and the clouds look more like smoke than anything. Foreground tonality is strange, and perhaps the landscape purists would have you clone out the telegraph poles. I guess some sill tell you its underexposed, but I think your choice is quite carefully made, and quite effective. Dealing with whites like this is a tricky decision. Those clouds look amazing! what a neat vantage point. The only odd thing is the ground looks strange desaturated , even if it even was. I see why you might have decided on it, perhaps just a partial not full desaturation would've been better? Proudly hosted by Sargasso Networks. Current Server Time: 04/21/2019 04:48:10 PM EDT.